After registered, please log in to create Company Profile Page (click here to read how to create). Other page cannot be created if Company Profile is not available. If you haven't registered before, please click here. Edit member information such as Company name, Contact name, Address, Tel, E-mail, etc. Change password to access the system. Enter to Page Management Control Panel. There are 5 types of pages that are Company Profile, Home, Content, Presentation, Inquiry. User can create pages that contain pictures and information about member's company profile, product, service etc. Change design of main template from the list in system. This is for making unique style for each member. List of incoming inquiry from Inquiry Page of member is stored here. List of sent out mail, reply of inquiry. Make mail and send to desired destination e-mail, via Fact-Link system. Send support requirement or inquiry to Fact-Link's staffs. 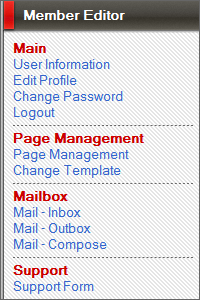 Page Management Control Panel. There are 5 types of pages that are Company Profile, Home, Content, Presentation, Inquiry. User can create pages that contain pictures and informations using 3 supported languages - Japanese, Vietnamese, English. As you can see 3 red frames in the picture, in each column means each language. There are tools for manage in each language. - Company Profile shall be created first. - Expand detail is for Content and Presentation only. - Content Page can create unlimited. Company Profile, Home, Presentation, Inquiry can create only once. - Any pages except Company Profile can turn on - off. 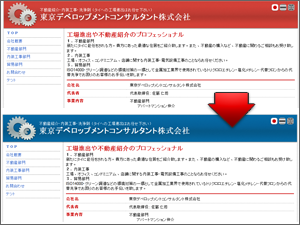 Basic Member can change main template design of pages by selecting from the list in system. This is for making unique style for each member. Template design will be increased in the future.